Grimy Goods shares the latest music video from Tree Machines today. This one is for the title cut from the just-released debut album Up For Air. The band plays a record release show this Friday at The Hotel Cafe in Los Angeles! "You can hear the band experimenting with folk electronics," says Impose. Hear the title track from the upcoming debut album Up For Air by Tree Machines now. A five-track sampler from Tree Machines (four cuts from the upcoming debut Up For Air plus a remix from :DFACE) is currently featured over at NoiseTrade. The "pop-infused electro-rock duo" also chats with writer Will Hodge about moving from Kansas to Los Angeles, the inspirations behind their music videos, and how Radiohead and alt-J influenced the electronic elements of their sound. A deep cut from the upcoming debut album Up For Air by Tree Machines (Sept. 22, Man In The Machine) is this "non-traditional electronic pop single" called "Like A Drum." Hear it now via The Big Takeover. "Imaginative and exploratory." "Fade On" is the latest single from the upcoming Tree Machines debut album Up For Air, out Sept. 22nd. 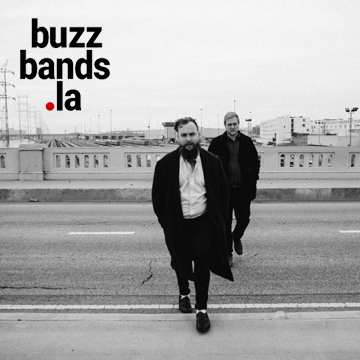 Hear it now via Buzzbands.la. Kevin Bronson says, "Theirs is a big, urgent, liberating sound, outsized indie-rock with pop choruses and churning electronics, a soundtrack to being unleashed from their former lives." Substream Magazine has the premiere of the latest music video "Weights and Stones" from Tree Machines (starring Sonic!) The band is also launching a string of summer tour dates today.